We are all going to experience difficult times as we journey through life and some will test our endurance and our human spirit. 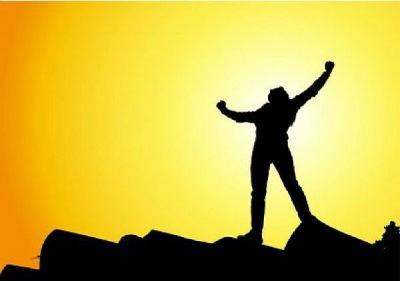 Although pain is part of the human condition, there are things that we can do to experience great joy again. In my practice as a psychotherapist, I have seen many people regain hope and rebuild their lives after enduring excruciating hardship. Below you will find three practices that are essential to overcoming adversity and moving forward in life. Allow Yourself to Grieve the Pain: Before we can heal, we must feel. When someone has been hurt or traumatized in some way and he or she attempts to just get over it without grieving it, a whole host of physical and mental health problems may arise as a result. When trauma is swept under the rug, the emotions related to that trauma go into hiding. They don’t simply go away. When they go into hiding and are not processed, they reappear. It may be months or even years later, but they resurface in one form or another. When emotions related to an earlier trauma reappear, they often come in disguise and resurface as symptoms. We may or may not be able to connect these symptoms to an earlier injury. These symptoms vary greatly depending on the person and the situation. They may appear as emotional triggers causing us to have an intense emotional reaction every time something reminds us of an earlier trauma. Sounds, smells, people, situations, and many other things can trigger strong emotional reactions within us. The disguise may appear as physical symptoms such as back pain, neck pain, chronic headaches, stomachaches, irritable bowel syndrome, and fibromyalgia. The unprocessed trauma can also show up as disease, anxiety, depression, and many other mental health disorders. In order to avoid these symptoms and heal, we need to allow ourselves time to grieve, feel the emotions associated with the injury, and nurture ourselves back to better health. There is no magical time period for the grieving process, but it is important to discuss our pain with a trusted friend, family member, or mental health professional. Finally, we need to let it go if we wish to be the best version of ourselves and experience joy in life. It is healthy to grieve, but at some point we do need to let go to move forward with your life. Many psychologists today are using an approach called radical acceptance to help themselves and their clients. Radical acceptance is an acceptance that comes from deep within and is free of judgment. It is not saying that something is good or bad; it is saying it just is. When we radically accept something, we stop complaining about it and start doing something to improve our life. Radical acceptance involves accepting things that we can’t change so that we can view life more objectively and then decide what we do have the power to change. Radical acceptance can be very freeing in that it empowers us to better understand where to put our focus so that we do not spend our days ruminating on things that are out of our control. Adopt an Attitude of Gratitude: It is in times of great trial and pain that we can choose to elevate ourselves to another level. We grow through the challenges in our lives. If we open our eyes to the lessons presented through each challenge, we can begin to stretch ourselves physically, mentally, emotionally, and spiritually. Instead of staying in a state of sloshy defeat that spirals us down very quickly, we can choose to look for the silver lining and live a life full of gratitude. This means that we must wake up to what we do have in our lives no matter what difficulties we have endured. Yes, this is challenging, especially if you feel as if you have had one hardship after another. But the more you practice expanding your awareness and looking at the larger picture, the more satisfying your life becomes. There is always something to be grateful for in life. 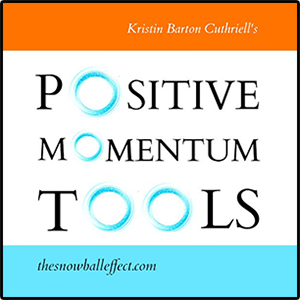 Kristin Barton Cuthriell, MEd, MSW, LCSW, author of The Snowball Effect: How to Build Positive Momentum in Your Life is a licensed psychotherapist currently working in a clinical practice, counseling individuals, couples, families, and groups. Kristin lives with her husband and their two children in Virginia. Her book is now available on amazon.com and barnesandnoble.com. 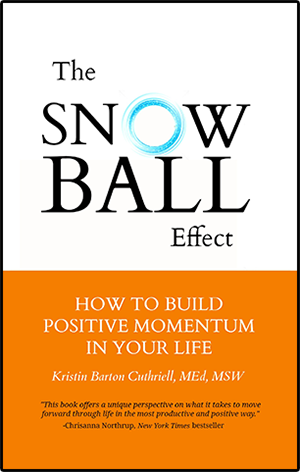 Visit Kristin’s website at www.thesnowballeffect.com for inspirational tips.